Department of Engineering / News / How does your smart city grow? How does your smart city grow? 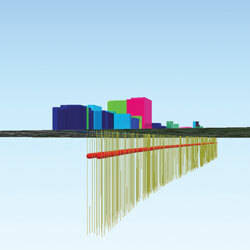 The Department of Engineering’s Centre for Smart Infrastructure and Construction (CSIC) is building on advances in sensing technology to learn everything possible about a city’s infrastructure – its tunnels, roads, bridges, sewers and power supplies – in order to maintain it and optimise its use for the future. We can’t just build our way out of this – we simply don’t have enough space. “Infrastructure, both existing and future, is of paramount importance for supporting economic growth and productivity – and so we must anticipate and plan effectively for the changing needs of society,” says Professor Lord Robert Mair of the Department of Engineering’s Geotechnical and Environmental Group.